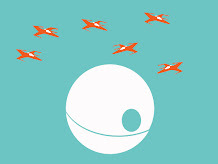 Star Wars Modern: Art, Then Disruptive Technology. I like to joke that Williamsburg was never an arts neighborhood. This ruffles a lot of feathers because, like all good jokes, its painfully true. (I am sure that the first human laugh was at someone else's expense, and probably involved a blow to the head or a kick to the pants.) Don't get me wrong, there were lots of artists in Williamsburg for a while, and a few of them are still there. But Williamsburg was never a viable place to go to sell art. A lot of art was made there, people went there to look at art, to talk about art, but not to buy and sell it - at least no enough to matter. The internet is a Williamsburg. A lot of artists live there. Many of us go there to do do work. Lots of us go there to look at art, but no one is buying - at least not to any degree that matters. Like every other city in the world, there are framers and coffee houses and little galleries in every neighborhood of New York. Change a light bulb and no one calls you a plumber the old joke goes; a gallery or two does not make an arts neighborhoods. How much art matters? When I moved to New York in the summer of 1995 lots of artists were living in Williamsburg - the number was still growing in fact, but they were bringing there work to SoHo, or, increasingly to Chelsea - well, not at first. When I got here the only art space in Chelsea was the Dia, otherwise the Far West Side there was a waste of taxi cab garages and moving companies, seemingly too far a trudge from the subway to ever be as cool as SoHo (or Williamsburg). By the summer 1999 there were over 300 galleries in Chelsea, and Soho was reverting to just another New York Neighborhood with some galleries in it. The number I heard most recently, is that there are 500 galleries in Chelsea. I have made a couple sales over the internet. I am sure an increasing number take place there, but contemporary art sales still require air kissing, small talk, name dropping, flirting, one-upmanship, on, and on - in short, buying and selling art still requires all sorts of confidence building measures that require physical proximity. Some time, around 2000, the scales began to tip, from doing these corporeal exercises in brick-and-mortar white box galleries, to increasingly getting them done in art fair booths. Contemporary art went from a business with "seasons": Fall was when the big boys filled the galleries with their solo shows, January was when the hearty might discover a gallery taking a risk on an ambitious solo show by a bright young thing (or a more established artist yet to generate much buzz), and Spring was again given over to the big boys to show their muscles (there were some important women, but it was almost all men still). Summer was given over to group shows for the the dead, dying, yet to be born and still-born. 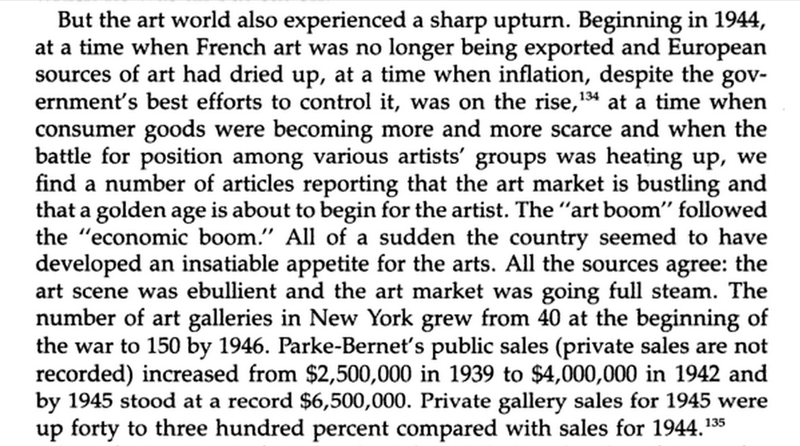 Except from page 91 of , Serge Guilbaut's How New York Stole the Idea of Modern Art (1985). That sets the stage for the artworld I witnessed the waning days of. The postwar galleries of Uptown and Midtown gave way in the vietnam era Downtown artworld of SoHo. There, "white box" galleries were built inside the cast iron factory/warehouse buildings of a dying industrial neighborhood. the mouldering plaster and lathe interiors were hidden behind cheap mass-produced wallboard and two-by-four construction, lit with equally cheap track lighting, and dressed with even cheaper paint; creating the famously/infamously "neutral" ground for generations of American artists to make their mark. I was one of the last ones to dance before the music stopped. My last show in SoHo was my first solo show. I have called the artworld, that I came to New York to be a part of, as the "Debate of Things. "It is an intellectual debate. But unlike most intellectual debates are based primarily, if not entirely in language ("Its text" all the way down!" cried the old woman). But like music, contemporary visual art is an intellectual world where words are secondary, after-the-fact. Readers of this blog, aquatinted with my spelling and grammar, may think they understand why I find that idea so attractive. Increasingly we think of athletes in terms of intelligence. I can remember Michael Jordan be spoken of as an athletic genius. But long before that, Frank Stella valorized Ted Williams, as the greatest living American. For those of us who think with out hands, on our feet, by doing, being an intellectual is something we are largely excluded from. "Dumb as a painter" isn't something you hear that often anymore, even in jest. The joke seems entirely lost on most younger people. (I still think it's hilarious). Art's expansion has tracked with our expanding idea of intelligence. The challenge the art fairs pose to those who want the Debate of Things to rage long and hard, it that art fair booths are to galleries what 60 second commercials are to an independent film. Artworks that once would have been contextualized within a carefully chosen body of artist's recent work, are now shown isolated, and hopefully for only a few hours, since once they are sold they will be replaced with a work that hasn't been sold. The art season survives, but only as a phantom limb. The real art calendar is now a punctuated series of weekends, Armory, Freeze, Basel... Like the big box retailers that art fairs resemble, gallerists (and their artists) are increasingly dependent of sudden floods of shoppers, once or twice a year. This post isn't a manifesto, or a call to arms. It's a biography. I love the Debate of Things, everyone I've met in the artworld love it too, for all the same reasons as I do. Most of the people I know who work in the artworld participate in the fairs to some degree. And while most express disdain, or at least ambivalence, some even find things to like about them. 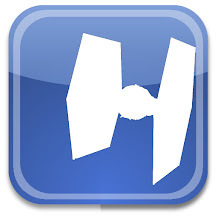 (I think they're great places to get laid.) I however, feel like an investigative journalist in the age of the blogger, or a musician in the age of file sharing. Like the loss of strong daily papers, news bureaus, and the album, something great has been lost and replaced with something "good enough".